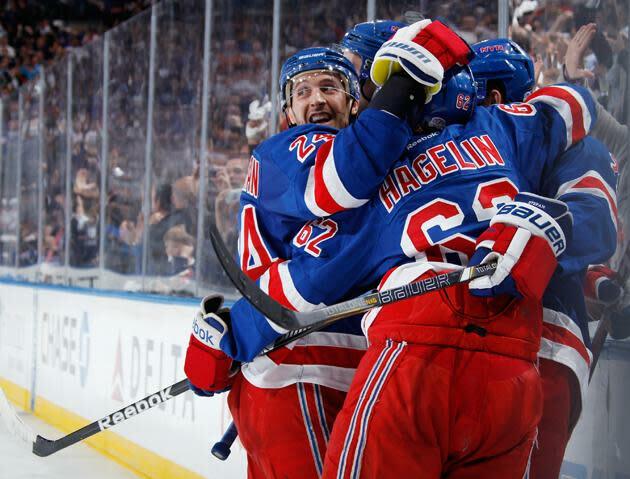 Hockey Hugs is a feature that celebrates the best in hugging from around the sport of hockey, because who doesn't love a good hug now and then? Have you seen a particularly good hug photo lately? Send it to puckdaddyblog@yahoo.com or tweet it to @HarrisonMooney. 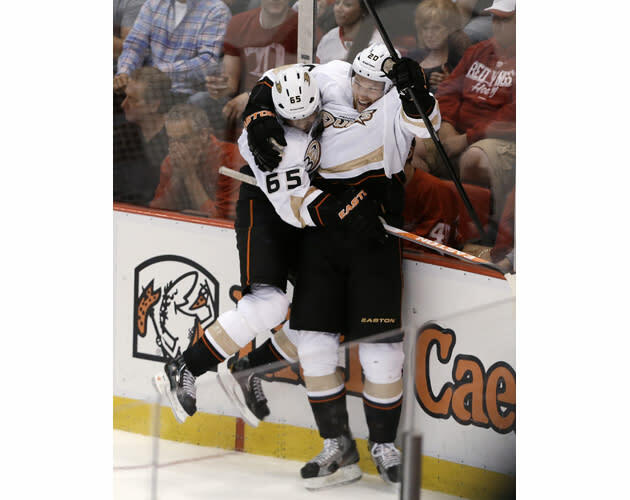 Welcome once again to Hockey Hugs. It's playoff time, which means this week's hugs are a little bigger, a little tighter, and a little more emotional. It means hugs like the one above, where the Rangers get together in a corner for a quick snuggle before a shift. That's Ryan Callahan, looking back at John Tortorella, who's screaming at them to get to the faceoff dot. And here it is in gif form. Adorable. Anyway. Let us now come together and watch the NHL's finest do the same. Emerson Etem tucks in his head to prevent against whiplash. David Steckel celebrates. 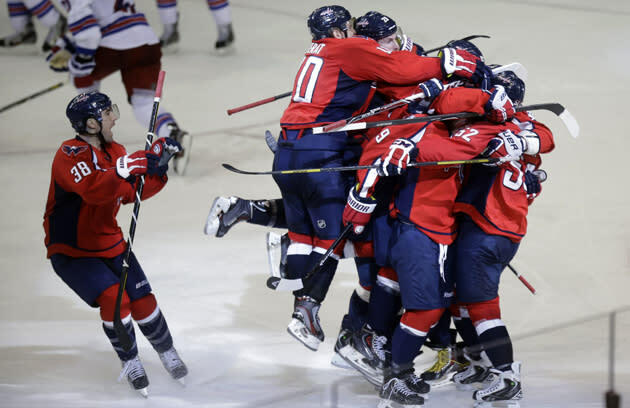 The Washington Capitals pile on, except for Jack Hillen, who cheers safely from outside the giant pile of men with knives on their feet. "Wooooo here I... hmm. on second thought, that looks really unsafe. I'll stay over here.... good job, everyone." This is a good hug photo. I love the framing and the way that it seems to be a weirdly private moment consider it's happening in front of a gallery of screaming fans. But what bumps it up to a great hug photo? 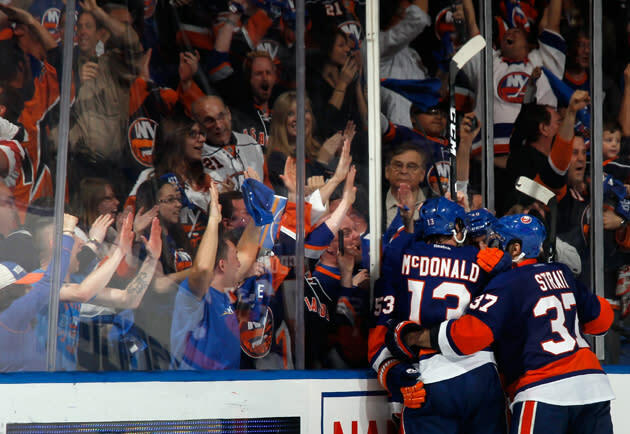 The man just above McDonald, who I imagine is not an Islanders fan. 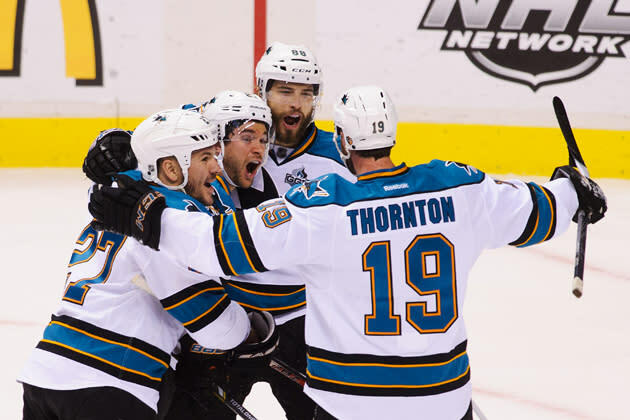 Joe Thornton directs the San Jose Sharks men's choir. "When you're a Shark, you're a Shark all the way! From your first cigarette to your last dyin' day!" Occasionally, Alex Ovechkin gets accused of not putting forth the right amount of effort. No one ever accuses him of that after goals. Here he is nearly killing Mike Green with a cross-body block.